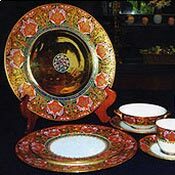 Benjarong is exquisite crockery made from clear-glazed porcelain and hand painted in traditional patterns by Thai artists. Benjarong means 'five colors' with each piece crafted from clay, fired in a charcoal oven, then hand painted with any or all of the five colors in 18th Century tradition. 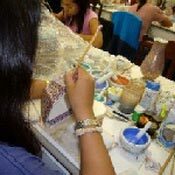 The Benjarong ceramics of Ampawa are precious works of art, created through devotion, long practice and the ability of a community to come together to create genuine delicate, traditional Benjarong porcelain. 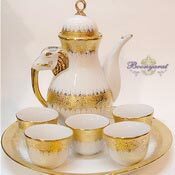 Popular among Thai royalty and the elite classes for their domestic use from the ancient Ayudhaya period to the early twentieth century, Benjarong was initially produced in China for the Thai royal court according to Thai designs. 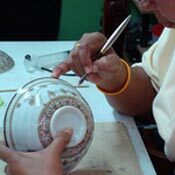 But later Thai craftsmen were able to produce Benjarong pottery by themselves. Benjarong reached its zenith during the reigns of King Rama II - King Rama V, when an almost endless number of exquisite designs were developed and produced, many of which are now highly treasured. 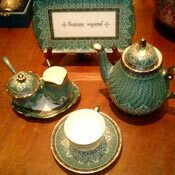 These days, Benjarong porcelain of Samut Songkhram is often been as a gift for participants at national and international events. 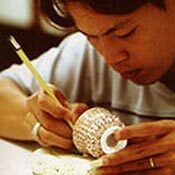 For example, Ban Phinsuwan Benjarong, produced beautiful mementos for the world leaders attending the 2004 APEC meeting hosted by Thailand.